Latest research has overturned the long held view that adipose tissue is merely a passive reservoir for storing energy. As adipose cells (adipocytes) become overfilled with fat their biochemistry changes. They secrete a wide range of highly bio active molecules(now called adipokines) with harmful metabolic effects. Excessive subcutaneous fat stores also lead to altered levels of oestrogen and testosterone playing havoc with individual’s physical condition. These fats can be determined to a moderate extent by using skin fold calipers at various parts of the body. Excessive intra-abdominal or Visceral fats stored around the organs are shown to be even more dangerous than peripheral subcutaneous fat. They are active triglycerides (fats) which are being broken down 24/7 releasing glucose and other harmful compounds into the blood stream turning the body into a fat storing machine. Obesity characterised by high levels central abdominal fat is typically seen in people with a paunch and is hence described as android. 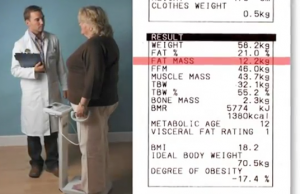 Central fat can to some degree be determined by measuring a person’s waist circumference. In today’s world it is essential that we can accurately determine Body Fat Mass and Visceral Fat levels . BMI readings are very often not an accurate determination of a person’s physical condition as it does not take muscle mass into consideration. BIA accurately assesses body fat , visceral fat ,muscle mass and bone mass by passing very small electrical currents through the body. It works on the basis that fat and muscle have different electrical properties. It is critical that we can determine each person’s body composition in order to compile a precise nutrition plan which will be specific to each person’s Fat Free Mass. We can accurately assess progress allowing us to fine tune the individual program ensuring dramatic results. Nothing is left to chance.